The Marathon Truss 2000 SQ System is a professional lighting truss that includes 2 Crank 2000 cranking stands, T-adapters, and a 10' truss. The entire system features a maximum height of 13.2' (4m) and 187 lb (85kg) load capacity. 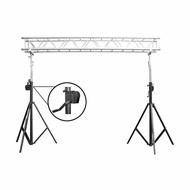 The truss is well suited for stage lighting, professional DJ applications, art installations, and much more.